The 2014-15 NHL season has just started -- with the Blackhawks making their regular season debut tonight -- but for many adults around Chicago, hockey isn't just what you watch on TV anymore. Due to the success of the Blackhawks in recent years, hockey has enjoyed an almost meteoric rise in popularity among adults over the past half-decade, according to the sport’s governing body. Many are trying the sport for the first time in their lives. "When I started playing hockey, I didn't know a thing about it," says Chris Byrne, a 31-year old who took up hockey three years ago. "I didn't know the equipment I needed. I had a general sense of the rules, but it's probably the first thing I have done that really pulled me out of my comfort zone." For some, the constant motion of the game is exciting. "Most big-time American sports have a lot of starting and stopping," says Mike McGivney, a 32-year old who first took lessons in 2012. "Hockey keeps going. Guys jumping on and off the bench all the time. It doesn't stop." Byrne and McGivney are among a quickly-growing population of adults in Illinois who have recently taken up the game. 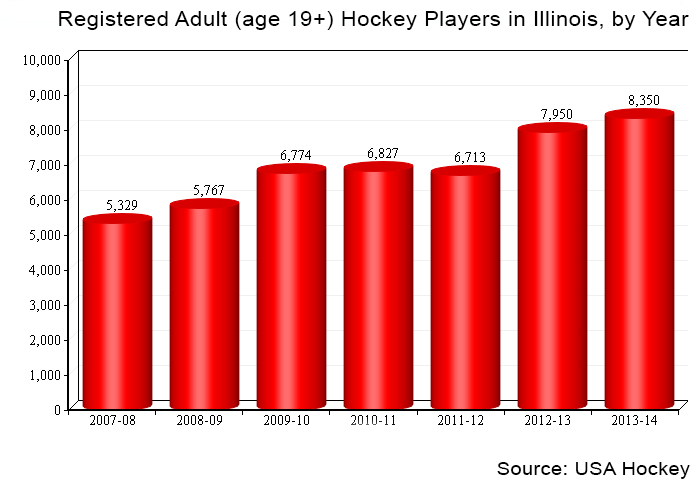 According to USA Hockey -- the governing body of hockey in the U.S. -- the number of registered adults playing the sport in Illinois has grown 45% in the past five years; from 5,767 players aged 19 and over in 2009 to 8,350 in 2014. But not every rink or league requires its players to be members of USA Hockey, meaning that the number of adult hockey players in Illinois is actually higher. No small wonder, considering that hockey has a very steep learning curve. Many rinks in the Chicagoland area have taken notice, and offer lessons for adults who wish to learn. Skokie, Franklin Park, Orland Park and Romeoville are a few of the suburban rinks that have hockey lessons for adults. Johnny's Ice House, located near downtown Chicago, has several different levels of lessons, from absolute beginner to more advanced classes that teach strategy and team play. The cost is usually around $200 for 10 lessons, depending on the rink. However, most rinks waive the tuition if a student decides to play goalie. 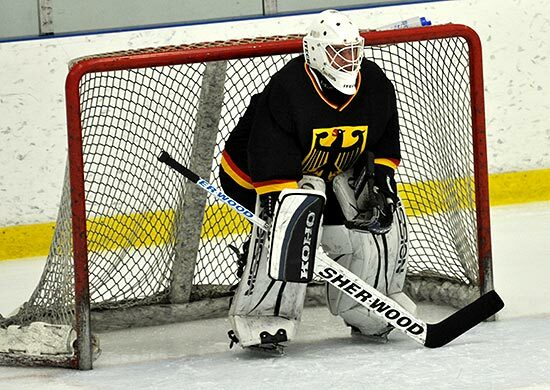 Goalies also play for free in most recreational hockey leagues, because they are always in high demand. Many want to score goals; far fewer want to prevent them. McGivney is one such student, who relishes the opportunity to stop the puck. "You have this challenge ahead of you; you have to focus," says McGivney. "The physical and emotional exertion it takes to play goalie is gratifying." For most adults, hockey has a price -- even for those who play for free. "Being able to recover is the hardest thing," he says. "Dealing with the physical toll on the body. If I was 15, the next day my back wouldn't be as stiff and my knees wouldn't be that sore. The next day, it's tough." Another upside of playing hockey that many don't consider is that it makes watching the professional game more enjoyable. "I have a much deeper appreciation for the level of skill that good players have," says Byrne. McGivney agrees: "[Playing] really deepens my level of understanding for the game itself, and made it a better viewing experience."